The Chinese poem describes the view of the lake which the observer is offered at different times of day: the morning view of the lake’s gently rippling, glittering surface; then in the evening the threatening clouds suspended over the filigree-like mountain villages; at night, the lively scene of the fishermen who, like the pine tree, must withstand wind and weather. At the central point of the picture, the large pine tree of Karasaki soars up next to a little Shintō shrine, dedicated to the kami(god) of the tree. 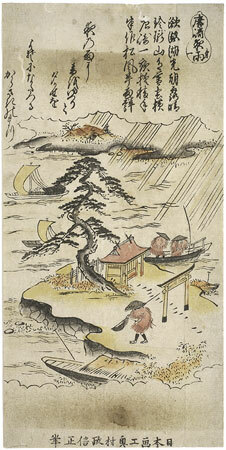 A fisherman in a mino robe strides past the torii, a net over his shoulders, towards the promontory. To the right, two others in a boat go about their business. In the foreground to the left, another boat is anchored. On the lake, boats are returning home, with filled sails billowing. In the background the roofs of a village are hidden behind trees on the shore. Heavy rain is falling, indicated by parallel lines. Masanobu’s landscape compositions are more organic than those of Shigenaga in the series published by the publishing house Edo-ya, which is clearly more „archaic“ and more indebted to the popular illustrations of the 17th c. stemming from the Tosa School. The leaf was originally in the Brettschneider Collection, passed on to the Stoclet Collection, and then to the Kaempfer Collection.